The galaxy at large. A large void that holds tens of thousands of planets with millions of species and organic creatures. Ruled by an oppressive Empire, many of the galaxies residents have become displaced and displeased. A change is coming to the galaxy in the form of a growing movement of freedom fighter. 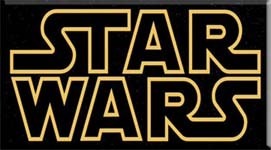 Hero's of this growing movement include the brash Han Solo, Princess Leia, Chewbacca and droids R2-D2 and C-3P0. But the most interesting rising hero is the young Luke Skywalker, a force strong individual who is training in the long dead ways of the Jedi Knights. The forces of good and evil stand at the brink of battle, a battle which will decide the fate the galaxy! with action Light Saber and removable cape. with Laser Rifle. Only available in the original "sneak peek" 4 figure package that also had the double telescoping lightsabers. 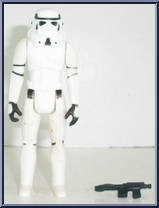 Figure comes with Stormtrooper style pistol. with shining eyes and Laser Gun. with shining eyes and Laser Gun. 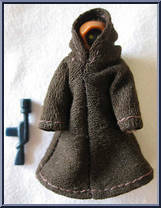 The vinyl cape jawa is the most notorious variant in the vintage line as the most well known and the most faked. Kenner decided that due to the small stature (2.25&qu. 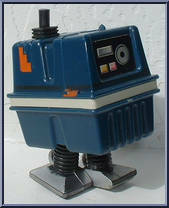 . .
with movable legs and head that "clicks". Exclusive version, only came with Sears Cantina playset. Came with Stormtrooper style pistol. Regular carded version. Came with pistol shown. in sand fighter costume with Gaderffii Stick.